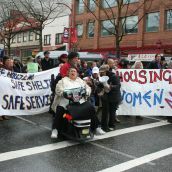 A vibrant march demanding 'No More Stolen Sisters: Safe Shelters, Safe Housing, Safe Services!' 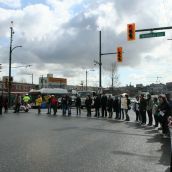 left the intersection of Main and Hastings earlier this afternoon. 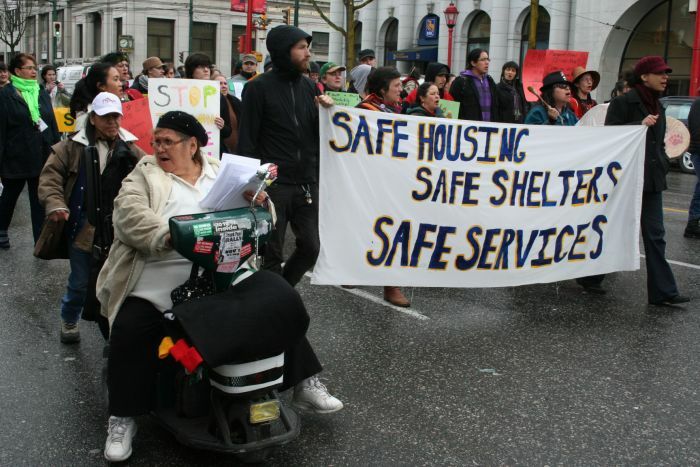 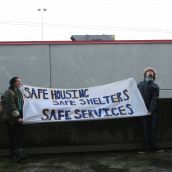 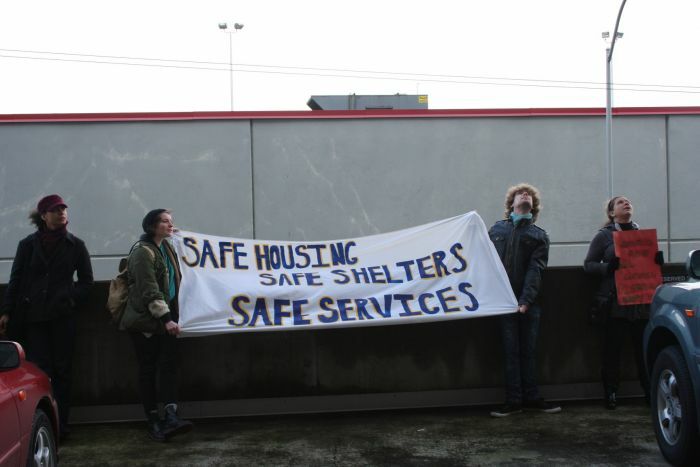 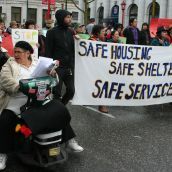 Organizers denounced the inaction of all levels of government in the face of male sexual violence against women in Downtown Eastside shelters. 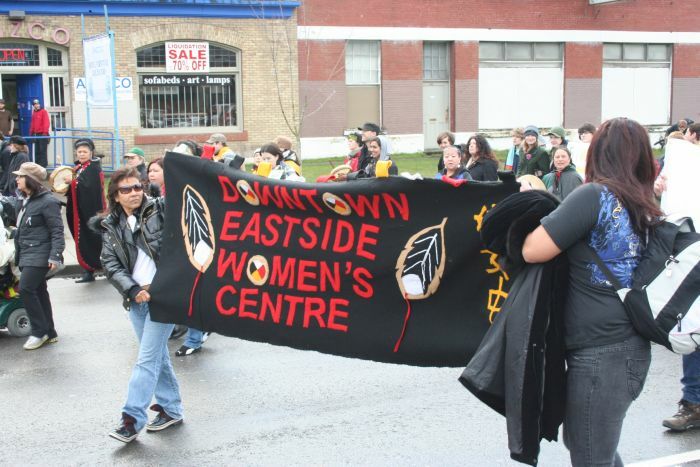 "The silence and normalization of violence and sexual assault against women in this community is unacceptable. 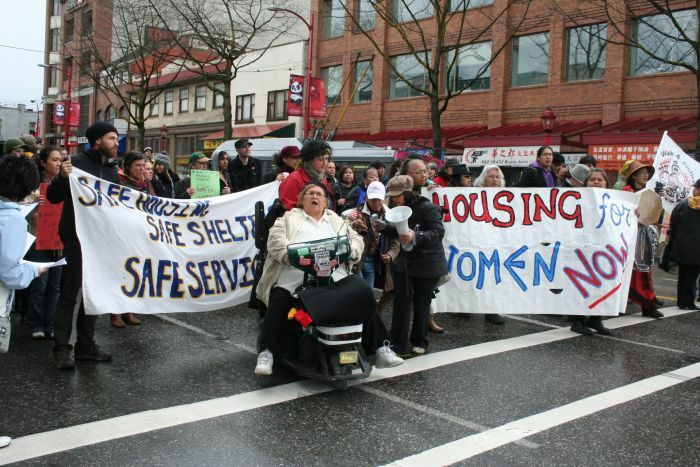 BC Housing and the City of Vancouver are responsible to ensure that safe services are equally available to women in this community," stated Alice Kendall, Coordinator of the Downtown Eastside Womens' Centre, in yesterday's press release. 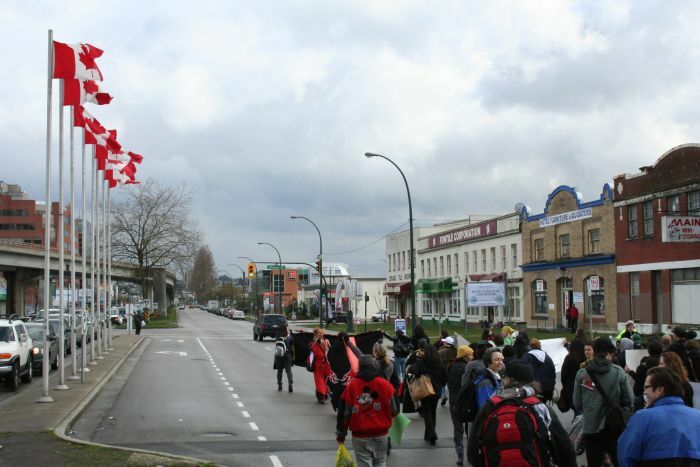 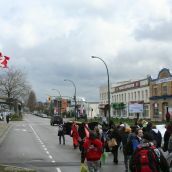 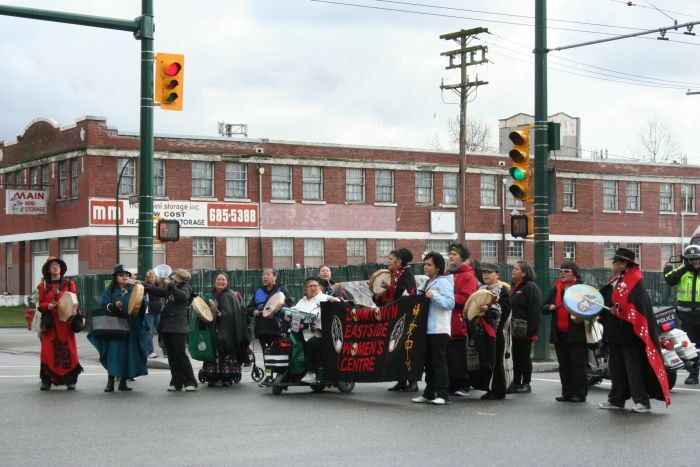 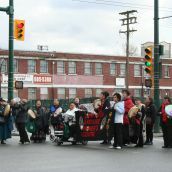 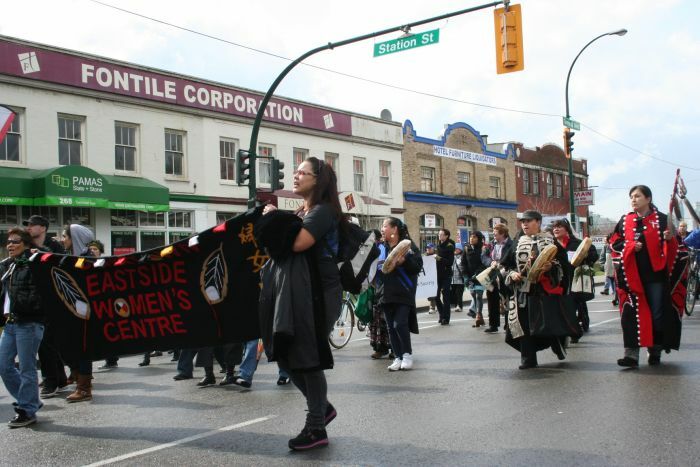 The women's and Downtown Eastside community march took one side of the street and occupied several intersections along the way. 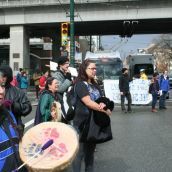 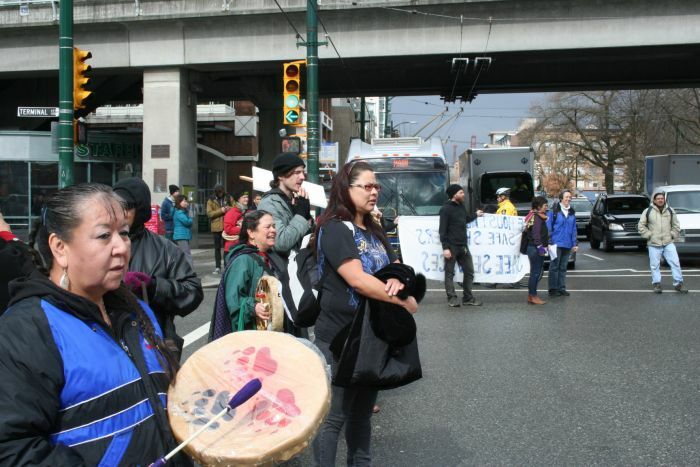 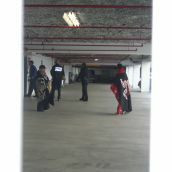 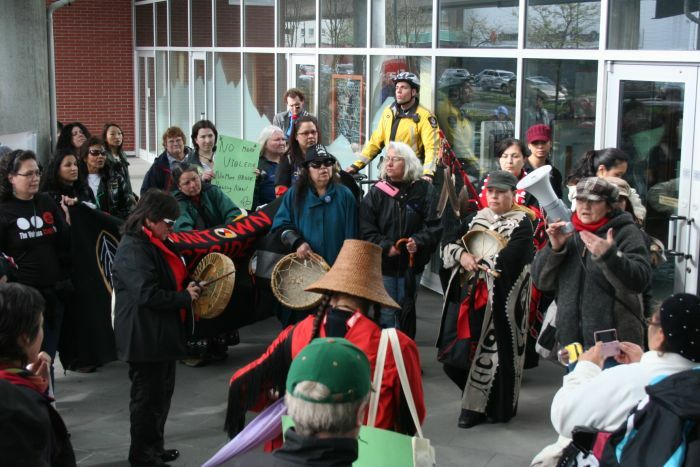 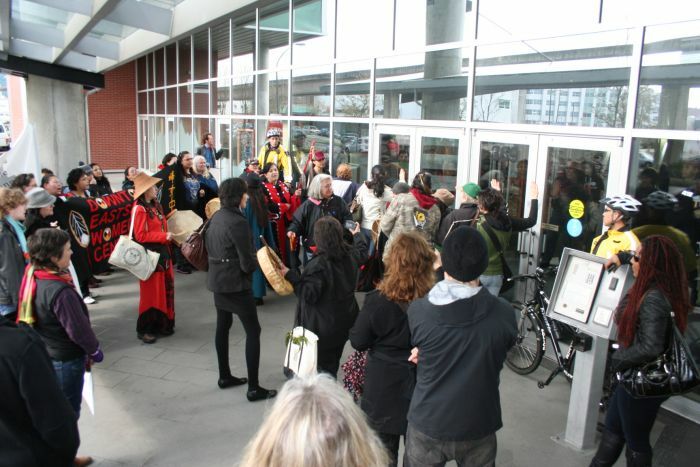 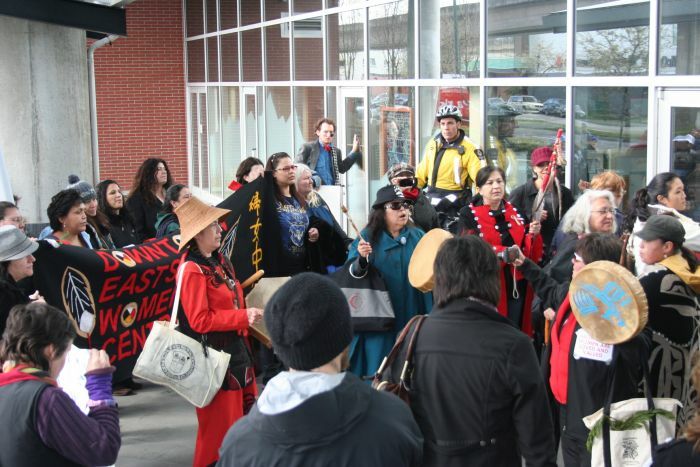 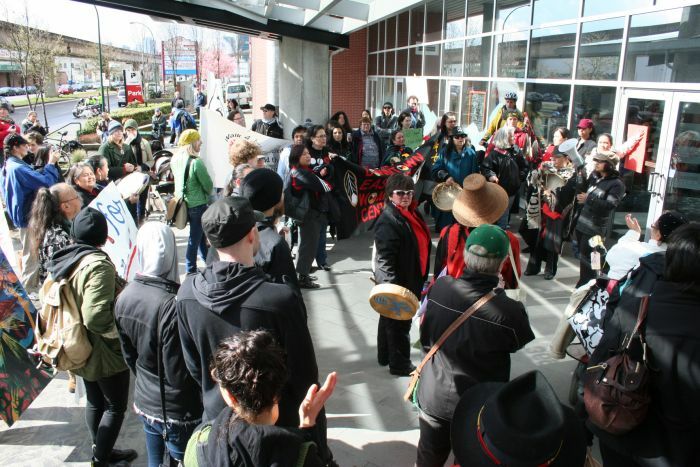 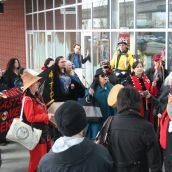 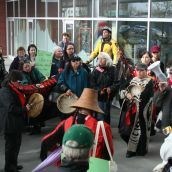 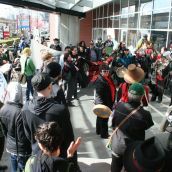 While march participants formed a circle around Indigenous drummers at Main Street and Terminal Avenue, organizers informed those present that the nearby BC Housing office had locked its doors to prevent the entrance of women organizing a direct action. 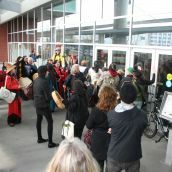 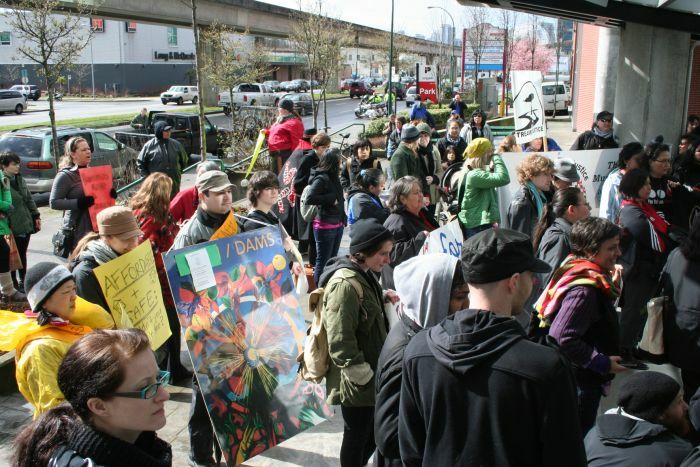 The community march arrived at the BC Housing office building doors at 369 Terminal Avenue shortly thereafter. 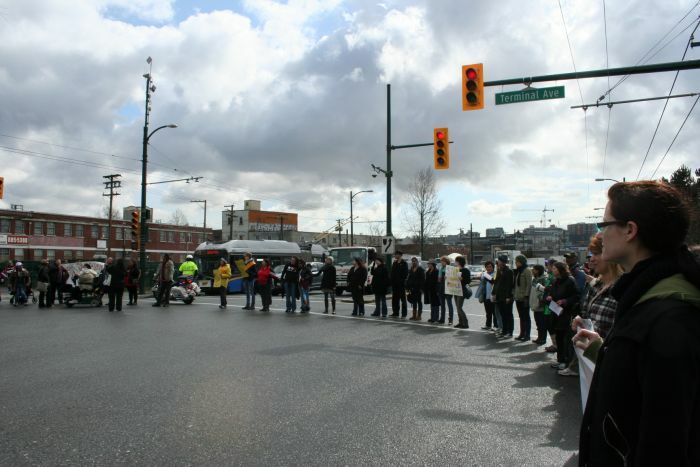 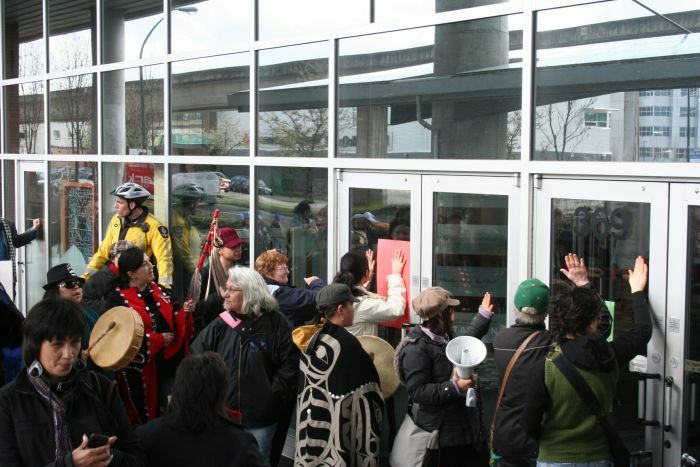 Women's demands to get a response were ignored by the few Vancouver police officers on either side of the glass. 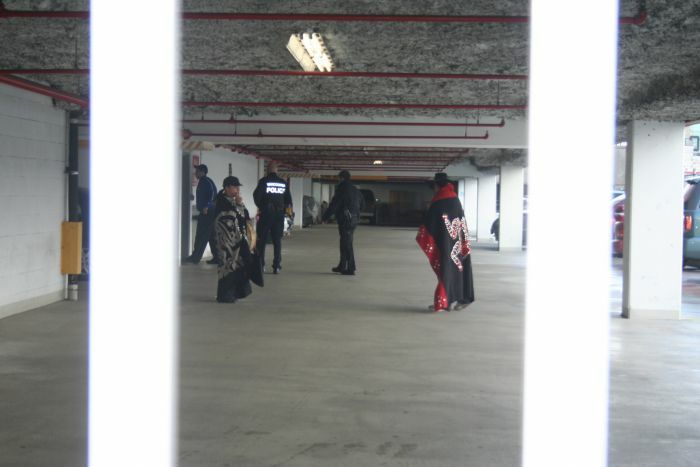 Organizers also entered the parkade around the back of the building, effectively blocking the vehicle exit. 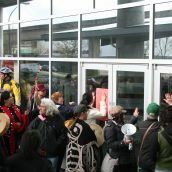 As of 3pm, march and action participants declared their intentions to remain outside the doors as long as necessary. 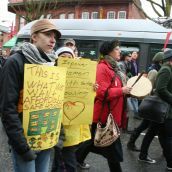 Update: See article by Lauren Emily Oxford HERE. 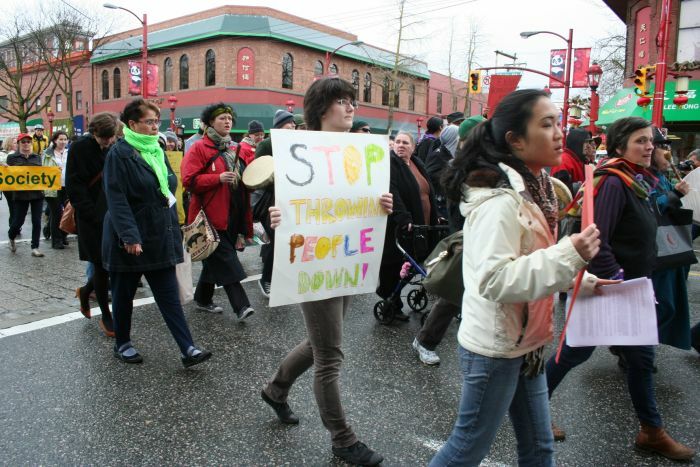 So great to see this story - with photos! 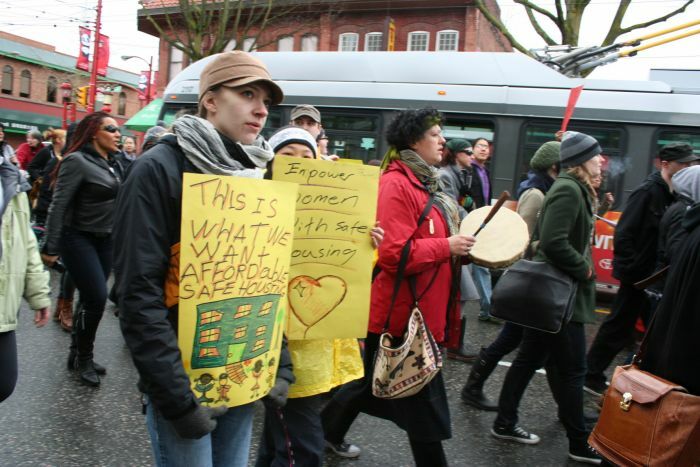 Take care down there - from Nelson/Slocan Valley & basically the Kootenay Region. 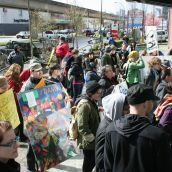 I felt so bad for not being able to make it out to this one. 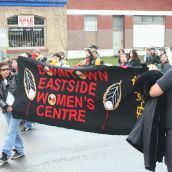 Great Photos and article Sandra! 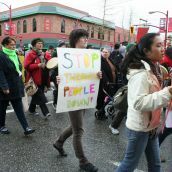 Thanks & please check out other article! 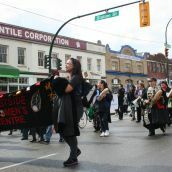 your cool photos...Viva la resistencia!